When hanging a picture on the wall a nail and a quick look to see if it looks level is normally good enough. If it is off by one or two degrees, unless everything around it is perfectly aligned, it may be look level. If a flight takes off from New York destined for Tokyo and the flight path is off two degrees it will end up in a completely different country. Two degrees Celsius was the focus of COP21 in Paris (also known as the 2015 Paris Climate Conference), where, for the first time in over 20 years of UN negotiations 190 countries, aim to achieve a legally binding and universal agreement on climate, with the aim of keeping global warming below 2°C. Together with our VP of strategy Peter Milsom I attended COP21’s business forum at the invitation of Caring for Climate and the UN Global Compact to support as a signatory to both and to participate in a solutions based approach to avoiding the 2degree increase. The science community has concluded that if we increase to 2 degrees, it will have impacts to our world that will have devastating effects to our way of life. 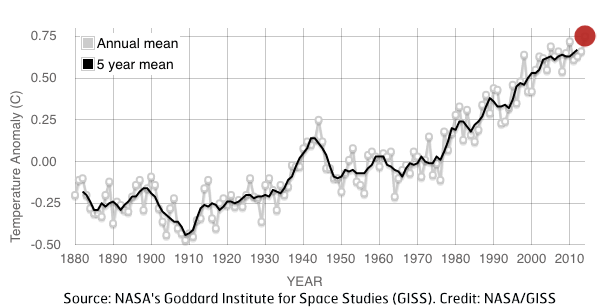 Since the industrial revolution, global temperatures have increased at a constant rate. The ten warmest years in the 134-year record have all occurred since 2000. This graph illustrates the change in global surface temperature relative to 1951-1980 average temperatures. The 10 warmest years in the 134-year record all have occurred since 2000, with the exception of 1998. The year 2014 ranks as the warmest on record. Increased base temperatures won’t just be bad news for for polar bears people who live along coast lines. If this continues dependable food and water supplies could be disrupted, disease could spread to new areas see the rise in Dengue Fever in Bhutan for example (source), and rising seas could remake our world maps. We can expect extreme weather, more and worse droughts, wildfires, and if resources become scarce it can lead to an increase in violence. At COP21, nations are gathering to discuss climate change and to work together in order to find a solution to the increases that are caused by human activity. There are several factors at play such as un-sustainable business practices, increased methane due to cattle farming to meet a growing demand and population, and the increasing world population itself. We are using our natural resources faster than they can replenish themselves. The business community is well-represented at COP21 — and it has been a much more engaging and solutions focused summit than its predecessors. It has become clear that the cost of inaction is greater than the cost of action to curb climate change. This is something that business can grasp. Our (GPM’s) role is in all of this is to advocate to the organizations that are in support of this to not only talk about the need, but the how. 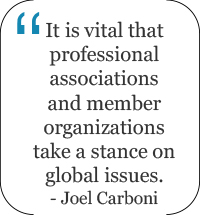 Practitioners look to professional associations and organizations for guidance and to ignore climate change is the same as telling our respective professions that it is not their remit when it is up to everyone. In our project management methodology PRiSM, we have activities that are designed to account for environmental impacts such as Green House Gas Reductions. See an example below. It is now in the hands of our nations to come to an agreement. Once they do, we are ready to do our part. Sustainability starts with project management. Joel, It was great that you went out to the conference. It must have been a great experience. There has been some criticism saying the conference did do enough to cover things like how nations could get penalized if they don’t do what they say they will to play their role. Others complained that there were no clear agreements on the HOW. I believe it was a good start. At least we have some movement. The next step would be accountability, discovery, planning, action and execution, and governance. I see PRiSM as an important roadmap that shows how we can turn ideas into reality. Why sustainability focused project management is the only way forward.